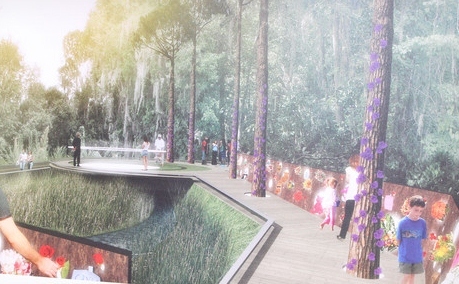 An unusual and beautiful park like memorial for Caylee Anthony was revealed on August 9th, the birthday of Caylee by Bring Kids Home, the non profit organization who has an option to purchase the site where Caylee’s remains were found 6 months after She was presumed to have died. 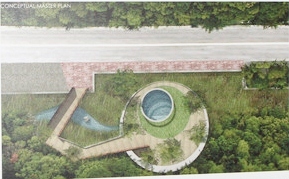 The memorial takes into consideration the natural beauty of the wetland where it will be built. 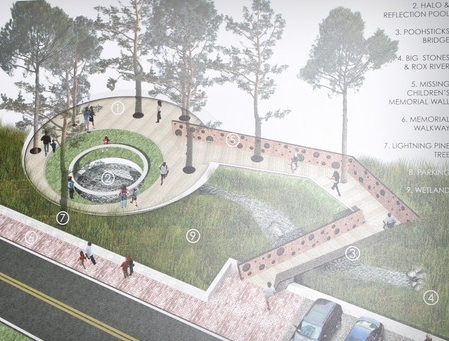 It has a walkway that will circle the general area where her remains were found and great effort is made to keep the area as natural as possible while, at the same time, providing a comfortable place for visitors to rest and contemplate the brief life of Caylee and the effect she has had on all who followed Her story. Also included in the monument will be a walkway made out of bricks engraved with the names of those who have donated towards the building of the monument. Bring Kids Home is a New Jersey Based Non Profit that receives funding, in part, from an anonymous trust from an estate. 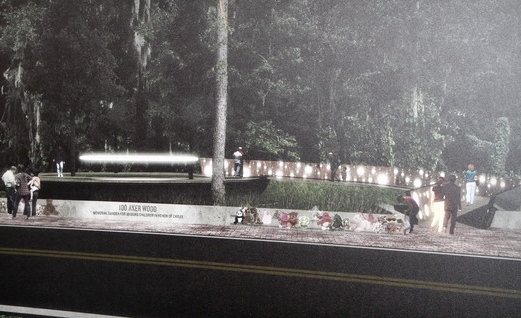 The charity plans on asking for the public to donate $25,000 towards the monument with the rest coming from corporate sponsors and other funding sources. 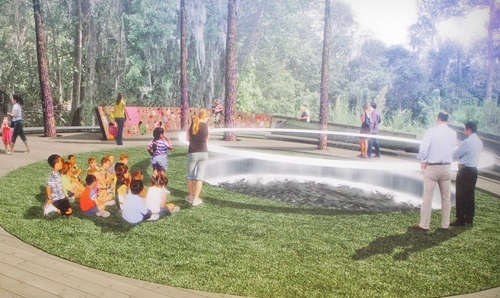 It will be interesting to see if BKH is able to succeed in building what might turn out to be a striking and fitting memorial to little Caylee Marie Anthony. This entry was posted on Wednesday, August 10th, 2011 at 8:32 am by murtwitnessonelive and is filed under Uncategorized. You can follow any responses to this entry through the RSS 2.0 feed. You can leave a response, or trackback from your own site. They signed an option for the property. There is a “sale pending” attachment to the realtor sign. I do not know the specific status of the sale other than they are probably trying to procure the funds. There is an equally divided opinion on if the monument should be built. I think their goal is to use the monument to try and raise awareness of missing children and use it to further their cause. THIS IS MAIN ADDRESS IN WASHINGTON, D.C. TO BRING FEDERAL CHARGES AGAINST CASEY ANTHONY. PLEASE SEND ALL LETTERS TO THIS ADDRESS BELOW! A STATEMENT HAS BEEN MADE THAT AN ACTUAL LETTER NEEDS TO BE SENT. YOU MAY CALL THE ATTORNEY GENERAL @ 202-514-2063. She violated her childs civil rights by not calling 911 and reporting her daughters death to law enforcement, violated her daughters basic civil right to emergency services and life saving techniques. Every person should have the basic right to receive life saving techniques. We owe the little child a proper burial, which includes discerning what exactly happened to her. The federal government is required to step in when a citizen’s civil rights have been violated. The childs inalienable rights were not only violated, but stolen from her. The Federal Government is separate from the state. The state of Florida let her go but the Federal Government could pick this case up and retry Casey if they wanted to. It would only be double jeopardy only if the same court wanted to try her. tThis ia the best thing ever to honor those that have been taken away……the death of our ‘little wonder”..has hit all of us very hard and to just feel her smile down to us on what is taking place to the site that was meant for death is now made for live…….God bless you for doing this for all of them….and I plan to buy a brick because this “little wonder is now part of my life…We love you Caylee…..